Who doesn’t fancy a new pair of super cool, ultra-light, polarized shades? Most of you! What if they only cost 40 squids? Show me where to sign! I love a new pair of sunnies, in fact I've always considered it nigh on impossible to have too many pairs of sunglasses, a bit like surfboards and fins really. Back in November, a very old and dear friend decided to pay me an unexpected visit here in Portugal. We hadn't seen each other in nearly a decade, though we chat on the blower all the time. He wanted to pop in, catch up, maybe score a wave or two. Though I was a bit taken aback when he asked if I might have a boogie board he could borrow, whilst here! This friend of mine...let's call him Bob. Bobs a bit of a dude, super talented musician and performer, mountain sports enthusiast and has carved out a very nice niche for himself in the French Alps. Bob dresses pretty cool and usually has the latest toys and gadgets. Picking Bob at the airport I couldn’t help but notice his very cool looking shades, 'where did you get those' I asked gesturing to his shades. And here they are, the contenders from Cab9. Putting them on, the first thing I noticed was how light and comfortable they were. Suitably impressed, I told Bob I had to get myself a pair. Bob replied 'cab9eyewear.com is the website, there loads of cool styles on there. A couple of days into Bobs stay, after a night or two with far too much pop, we were chatting about where life had taken us etc. I mentioned that in my spare time I had been writing the odd article for Surf Bunker Mag and maybe his friends at Cab9 might want a bit of exposure if the sunnies lived up to the hype. I can tell you that Cab9's are very good at checking the surf. Proof. We both agreed that this might be a good idea and I might get to add to my Sunglass collection...everyone's a winner, baby. Bob returned forthwith to his life of rock and roll in the alps, but told me to get in touch with Paul at Cab9 which I proceeded to do. Two weeks later and just in time for my Christmas holiday in Fuerteventura. Voila, a little package arrived on my doorstep with Cab9's latest model inside. First thing that stands out is the packaging, its premium quality, if it didn't say Cab9 on the box, you could be fooled into thinking that the latest high-end smartphone had accidentally turned up with Santa. Inside were the usual micro fibre pouch, a couple of pretty cool stickers, information and warranty card and a pair C9X with Blue Revo lens. Swish. These are very comfortable, very light sunglasses. I tend to put my shades on in the morning and they pretty much stay there all day, in fact I'm well known amongst my peers for having glasses on my head when it's not really necessary or appropriate. Cab9's you don’t even know they are there. My Cab9's are my new daily runners. Simple, durable and seem to resist scratches. So far, so good. 'What about their actually purpose?' I hear you ask. Well, I wore them for the whole of my 2 weeks in Fuerteventura! They are visually very clear, with no distortion that I could make out, really good for driving, being polarized really helps. On the beach staring at the ocean all day...they do the job. I mentioned at the top of the article that I have a fair few pairs of sunglasses, one of the reasons for this, is that I tend to mistreat them. There's a lot of sand in my life, it gets everywhere, this isn't so great for lenses. I tend to clean mine with my T-shirt (we all do it), not the micro fibre cloth...this is a big no no. Our head developer and general boss gives the Cab9's a thumbs up in the office.
' TR90 was produced through Swiss technology as a thermoplastic material that is incredibly durable, flexible, and lightweight. Glasses made with TR90 are extremely comfortable because they have a flexible quality. Since they are flexible, they can bend under pressure and contour your face comfortably. With TR90 the proof is definitely in the pudding, as far as I can see, its a pretty top-notch choice for sunglasses and the boys at Cab9 should be commended for bringing out a high end product at ridiculously friendly prices. The Cab9 shades that we tested. These are my daily runners to give you an idea. The names include Oakley, Von Zipper, Rayban and others. 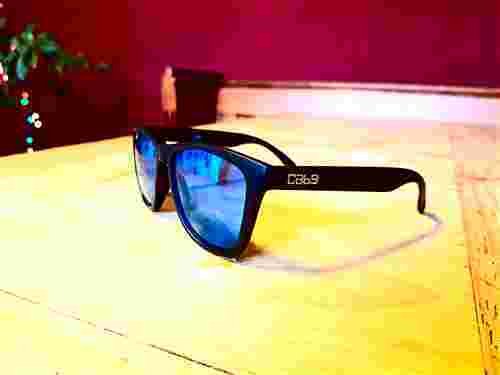 These Cab9 shades are made using the swiss developed material, TR90. They are lightweight, durable and won't break the bank.